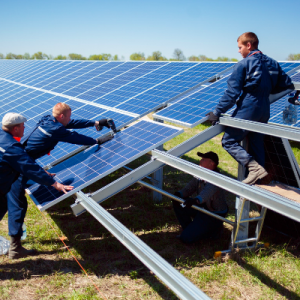 A large solar power plant will open this summer in the Brahin district, changing the landscape of the Chernobyl-contaminated lands: 85,000 solar panels will occupy an area the size of about 80 football fields. Proponents of green energy praise it as a win-win solution: sustainable, ecological, economically profitable, and a diversifier of energy supplies in the country. The authorities publicly acknowledge the need to support the renewable energy sector, promising tax incentives and preferential treatment for investors. However, most green energy projects in Belarus are in the shadow of the Astraviec nuclear power plant (NPP). In a few years, Astraviec will provide an effective and fast solution to Belarus' energy needs, further marginalising the renewable energy sector. Belarusian society has swallowed the nuclear power pill, despite the trauma of Chernobyl, since the state began marketing it as the single best way to secure the country's energy independence. However, the new nuclear power plant as an energy independence project does not eliminate Russian dominance in the Belarusian energy sector. Development of renewable energy in this respect looks more promising in terms of diversifying energy production. Wind energy came to Belarus in 2000 with the construction of two wind turbines in Miadzel district. Currently, the largest Belarusian wind farm has only 11 wind turbines. It started operating in Navahrudak district in spring 2016. Each of the wind turbines has an average capacity of 1 MW – enough to supply energy to about 500 households. The hilly landscape of the Navahrudak region makes it one of the most suitable areas in Belarus for the development of wind energy. According to estimates of energy sector specialists, renewable energy sources here have the potential to produce up to 24m kWh per year – enough to cover about 25 per cent of needs of the entire Navahrudak district. In recent years, cell phone operator Velcom invested €23m in the solar power plant project in Brahin district. The official power capacity of the station is 22.3 MW – enough to provide evening street illumination for the entire Belarusian capital. Velcom spokesperson Helmut Duhs presented the solar plant project in Brahin as a green business product, noting that such projects create new jobs and benefit local economies. In this manner, they help to revitalise regions that suffered from the Chernobyl catastrophe. The company plans to cover all expenses in four to five years, as Homiel region boasts about 1,900 sunny hours per year, more than any other part of Belarus. The land is also cheaper, as the Brahin district is not suitable for agriculture because of contamination from the Chernobyl fallout. Yet in reality, Belarus has a long way to go, especially compared to Germany, which recently made the headlines around the world when it managed to obtain 100 per cent of its energy supply from renewable sources. By contrast, the share of renewable energy production in Belarus remains marginal, at around 1 per cent. The law On Renewable Energy Sources, adopted in 2010, removed the state monopoly on energy production in Belarus. This opened the door for foreign investors, who are interested in renewable energy projects. At first, the Belarusian state encouraged them. It guaranteed purchases of green energy, offering tax incentives and special tariffs for a 10 year period to allow investors to cover their expenses. The state also ensured that the price that ordinary Belarusians pay for energy from alternative sources remained on the same level as the price of energy from traditional sources. Yet despite financial support from the EU and opportunities to attract investment from countries other than Russia, the Belarusian bureaucracy seems to acknowledge the potential of green energy only on paper, instead of genuinely committing to long-term sustainability goals. The Belarusian authorities often fail to win the trust of foreign investors, refusing to remove bureaucratic hurdles or endangering projects already in their implementation stage, as happened in 2012 with the planned wind park near Minsk. German company Enertrag AG terminated the project after interference from the Belarusian Ministry of Defence, which complained that it was disrupting the radar work. By 2015, the fortunes of green energy had changed dramatically. The state had the new NPP up its sleeve and tried to reassert its monopoly in the energy sector. The government promptly interfered with the introduction of quotas for green energy, limiting opportunities for investors. In the period of 2016-2018, Belarus set construction limits for renewable energy sources to the overall capacity of 215 MW. One argument for this is reduction of costs, as currently the state pays 41 cents for 1 kWh for energy from renewable sources, when the cost price is only 9 cents. The state is also reluctant to pay this money to foreign companies, holding on to its monopoly of the Belarusian energy market. What's in it for consumers? Belarusian energy consumers have a chance to become energy-independent by investing in solar panel for their houses, but this decision is a risky one as the expenses remain high. The cheapest solar panels for private use cost up to $2,600. This amount exceeds average salaries in the country almost eightfold. One of the principal risks is the issue of selling the excess energy to the state. In theory, the state has encouraged this by offering preferential tariffs since 2015. Yet in practice, this offer applies only to private companies and entrepreneurs, and not to ordinary citizens. The larger problem is the grim perspectives of green energy since the emergence of the Astraviec NPP, scheduled for launch in 2018. It is quite possible that the state might change the rules of the game once again, revoking preferences to private sellers of green energy. Thus, the unpredictability of the regime creates similar risks for Belarusian consumers as it does for foreign investors. In the long term and under favourable conditions green energy in Belarus could contribute to the energy independence of the country, as it has the potential to generate up to 25 per cent of the overall energy supply. Ideally, it also could help ordinary Belarusians to become self-sufficient in their energy production. Yet with the first Belarusian NPP in sight and without true commitment from the state, the future of green energy projects in Belarus remains uncertain. Comprehensive information on European Union- and European Neighbourhood Policy-related matters, including the best practices and future challenges, now publicly available online and accessible from mobile devices and tablets. Since March 2016, over 700 people from countries covered by the European Neighbourhood Policy have already registered for the E-Platform, administered by the College of Europe Natolin Campus, and over 400 people seized the opportunity to broaden their knowledge and improve their qualifications. Nowadays, it is almost impossible to consider effective and innovative teaching and learning channels without linking them with the Virtual Learning Environment, Information and Communication Technologies and tools for personalising the education for learners (e.g. B-learning). The development of electronic media, Internet, along with widespread use of mobile devices and applications, resulted in a massive increase of interest in information processing and knowledge creation through electronic learning mechanisms. In step with these educational trends, the College of Europe Natolin Campus, with its mission to foster knowledge about the European integration process, Europe’s cultural and historical heritage, and the evolution of EU policies, is putting into operation a unique electronic platform and blended learning instruments. The distance learning component, consisting of 10 knowledge-based e-learning courses and 5 skills-building courses. inter alia: Anti-Corruption, DCFTA, Human Rights Protection, IBM and Migration Policies, Effective Application for EU Funding, Fund-Raising Skills, and others. An Information Database System (IDS) with systematised public information and documentation on the EU, ENP, EU-ENP relations, and best practices. An online Expert Forum, enabling participants’ discussions and exchanges with experienced practitioners and scholars working on, or interested in the European Union- and ENP-related matters. Furthermore, the online component is accompanied by a series of face-to-face sessions/workshops for 150 best performing E-Platform participants (75 from ENP-East and 75 from ENP-South) which will take place in Poland. The participation, as well as training materials, is free of charge (including board and lodging, and travel expenses). highlighted an expert in economic policies of the EU, management and administration, prof. Tomasz Grzegorz Grosse, Head of the EU Policies Unit, Institute of European Studies at the University of Warsaw. This article has been produced with the assistance of the European Union. 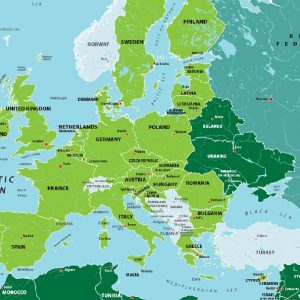 The contents of this article are the sole responsibility of the Natolin Campus of the College of Europe and can in no way be taken to reflect the views of the European Union.